Viewer Colty art. Submitted by Kristi in CALIFORNIA. It's been a banner week here at Cute with Chris. We've had over 200,000 hits on YouTube, been featured in The Guardian, and on Crunk and Disorderly, and my T-Pain clip was the number-one rated video on Digg on Wednesday. All this doesn't change the fact that we have a serious problem in this country-- horses and their drug use. I always thought Colty was just a little dim. Now I wonder if it wasn't the quaaludes. 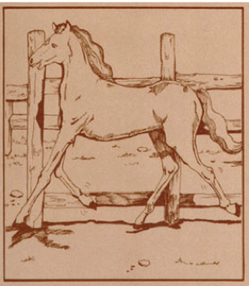 Click here to read the children's book Latawnya the Naughty Horse. Thanks to viewers Ted and Jill. Colty and I are travelling today. We'll be back with a new episode on Monday. Check out our brand new YouTube page. Tinsley is a viewer in ENGLAND who sent me these pics of the window display at Selfridges department store in London. 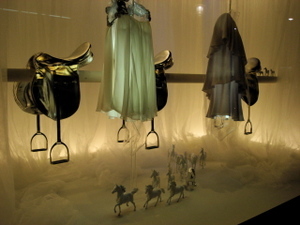 The window designer took a bunch of plastic horses, spray-painted them white, and arranged them in a herd underneath Gucci dresses hung on silver saddles. "None of them look like Colty," she writes, "but I know how much you like plastic horses so I took some pictures for you anyway. I thought you might get a kick out of seeing them." Thanks Tinsley. Click the pics to enlarge. More pictures from CWC viewer Amy. Click to enlarge. You may have missed: "Colty" at the National Zoo in Washington. 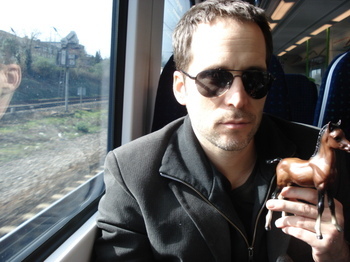 Amy is a viewer in VIRGINIA who collects plastic horses. Although her version of Colty has less white on its legs, you can see they're definitely related. Amy also happens to be a big fan of Butterstick, the youngest Panda at the National Zoo. She and her Colty took a drive up there this past weekend and she sent me this pic. It's a good thing there was glass between the two. Otherwise, there may have been a bloodbath. Er, "plastic bath". Thanks for the photo Amy. We're glad you made it back alive. Ashley, my 17 year-old viewer in CALIFORNIA is obsessed with Colty. She says she's working on a short video of Colty shooting real lasers. In the meantime, I present my crappy photoshop lasers. We await your genius, Ashley. 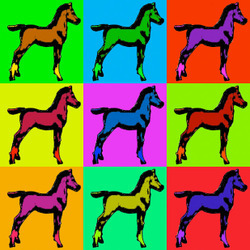 "Pop Art Colty" submitted by 17 year-old Ashley in CALIFORNIA. Exploring the ugly side of cute. On Cute with Chris dot com. I'm in Canada for the holidays. Here's a short video message from me. WARNING: Contains words that begin with the letter A, and end with the letters HOLE.